This café, Teo Kafon, opened in the Shinkyogoku Shopping Street just in 2016, and they offer matcha sweets and drinks. The concept of this café, which is easily recognized from its jazzy pink and orange sign, is the fusion of Japanese and Western cultures. The matcha sweets of the café are Japanese, but the atmosphere, look, and interior of the café are all trendy and cute! What is special about Teo Kafon is that their menu items can all be enjoyed together. Take for example their Teo Set, in which you get to stir matcha yourself. The owner of the café says that she wants all the people of the world to share the fun they have at the café with each other. How about enjoying matcha sweets and drinks at Teo Kafon, maybe as a break from shopping, or just to have a chat with your friends? The most popular menu item in Teo Kafon is this Matcha Sweets Plate. You have five different matcha sweets on a wooden plate. These mini-sweets are really cute! All of these sweets use matcha carefully chosen by Teo Kafon, and they all have a nice fragrance of matcha. I really want to recommend this plateful of matcha! 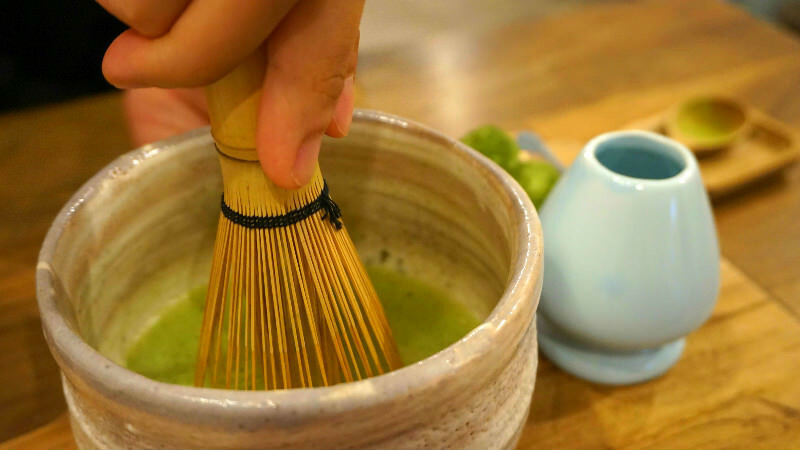 The café takes a part of its name from this Teo Set, and with this set you can stir matcha yourself! All of the menu items in Teo Kafon have thorough explanations below them, so don’t worry even if it is your first time. You have the matcha with high-quality Japanese sweets. If you have drink or foods to go you get a 50 yen discount! (Sweets not included) There is a square and a park by Teo Kafon, and if you walk a bit you can get to the Kamo River. It is a nice idea to have some Teo Kafon to go on a nice day! All of Teo Kafon’s menu items have explanations in English. 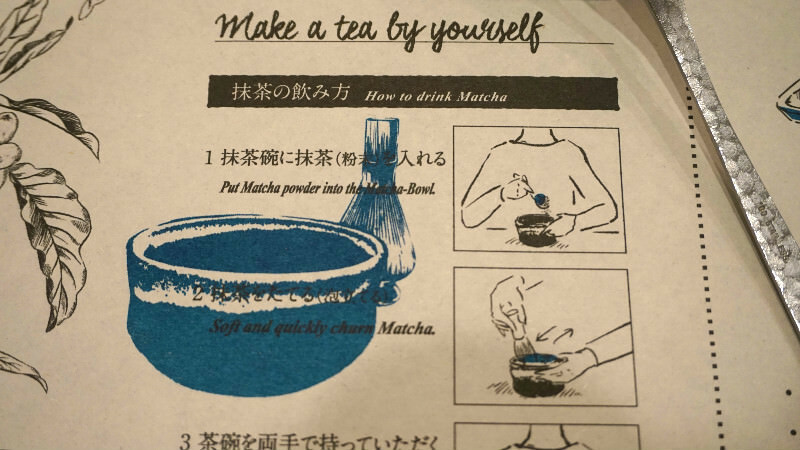 They even have explanations in English with pictures of how to stir matcha. First, you put some matcha in the cup. Then the staff will help you pour some hot water on the matcha. And after some vigorous stirring, you get matcha tea. I want to recommend this café because you get to easily experience Japanese culture! Teo Kafon is famous for their matcha and coffee, but actually, they have a lot of things on their food and drinks menu too! They have food items on their menu like roast beef rice bowl and sandwiches, but they also have shaved ice and all kinds of drinks too. It may be a good idea to come with your friends and share. You can have five kinds of matcha sweets at once; this is sure to satisfy even the most demanding matcha fans! I especially liked the matcha cream puff; the thick, rich matcha custard inside it is something I still dream of. 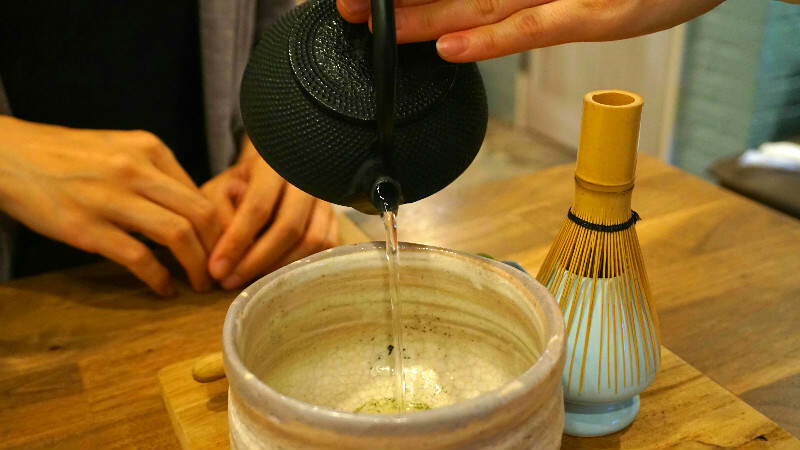 You can also get to try like a mini-version of the tea ceremony here; stirring matcha. 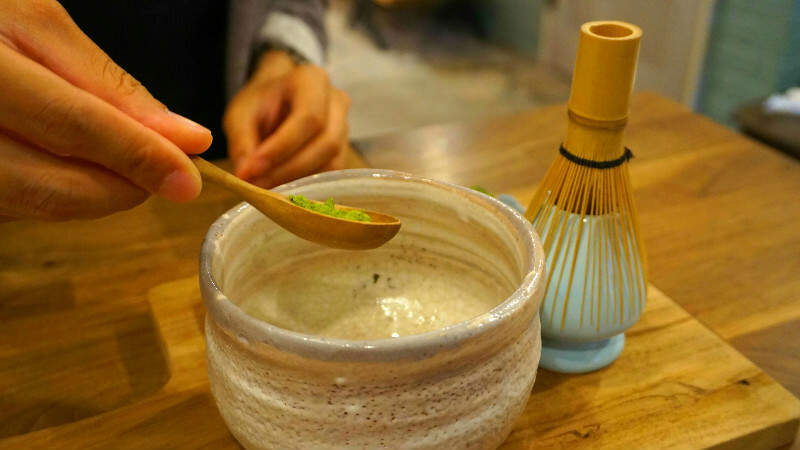 This place is everything a matcha fan could hope for in a café! Teo Kafon is an 8-minute walk from subway Tozai line Kyoto Shiyakusho-mae Station and a 7-minute walk away from Hankyu Kawaramachi Station. Tuesdays. *If the café is closed on other days they will inform you on Facebook and Instagram. Their menu is in English, and the feel of the café is casual and welcoming. They also have Wi-Fi so this café is a nice place to take a break. They have Wi-Fi; the ID and password are on the menu.